With former UFC Light Heavyweight Champion Jon Jones still on the sidelines due to a USADA violation, and current UFC Light Heavyweight and Heavyweight Champion Daniel Cormier waiting for Brock Lesnar to return from a USADA violation, the UFC's 205-pound division is in flux and waiting for the next title contender to emerge. 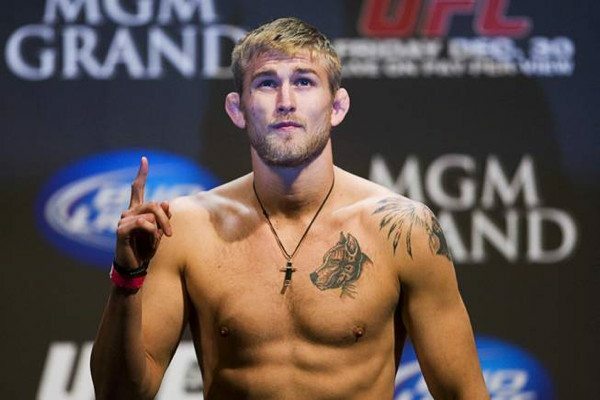 You'd have to give Alexander Gustafsson the upper hand in that race, as the big Swede was to take on Volkan Oezdemir at UFC 227 in a fight that would have solidified his status as the #1 contender at 205 lbs. Gustafsson, after all, is coming off of a brutal KO win over Glover Teixeira, and he's the guy who gave both Jones and Cormier their closest fights (aside from Jones' two fights against Cormier, of course). Gustafsson had been calling for the UFC to create an interim light heavyweight title, so you know he'll want to fight for the real title as soon as Cormier is ready to make a title defense, which, at this rate, might not happen. But if Cormier decides to just stick at heavyweight from now on -- and who can blame him, as he's looked so dominant there and he doesn't have to cut weight -- the light heavyweight division is going to need new contenders to match against Gustafsson in order to crown a new champion. 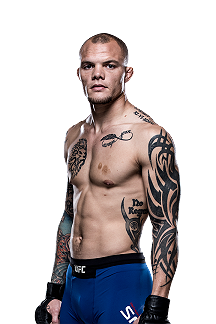 And we may very well see the next contender emerge at this weekend's UFC Fight Night 134 card, which takes place Sunday in Hamburg, Germany. 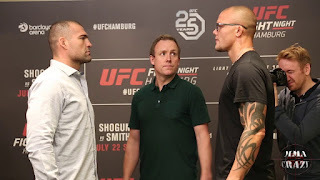 In the main event, former PRIDE legend and UFC Light Heavyweight Champion Mauricio "Shogun" Rua fights up-and-comer Anthony Smith, and that should be a fan-friendly bout. 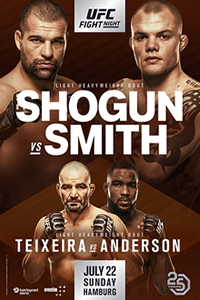 Rua has won three straight fights at 205, which is actually one of the longer winning streaks in the division, while Smith is 5-1 in his last six fights and is coming off of a huge KO win over Rashad Evans in his light heavyweight debut. 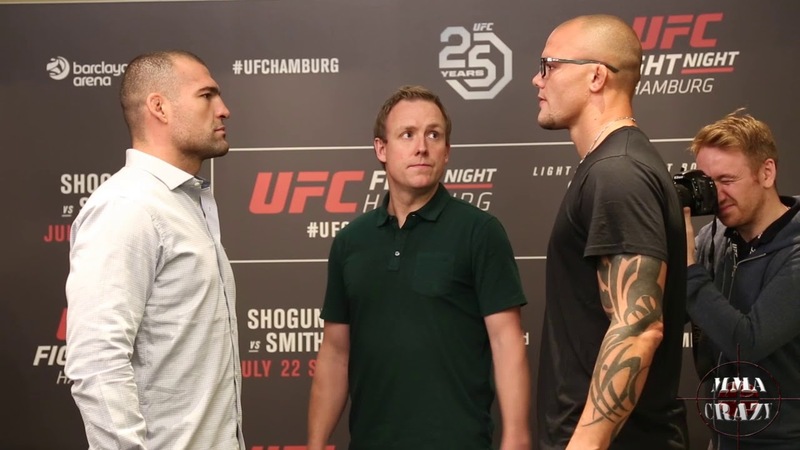 The UFC made this a main event for a reason, and the winner of the bout could easily emerge as the de facto next guy in line just based on the shallowness of the 205-pound division. 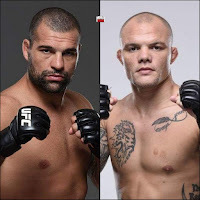 The same could be said of the co-main event between the aforementioned Teixeira and Corey Anderson, who filled in on short notice for an injured Ilir Latifi. Teixeira has had a few chances to get to the top, but he has always failed. 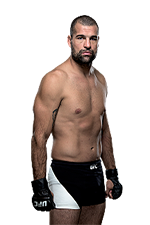 However, he's coming off of a brutal TKO win over Misha Cirkunov that showed he still has something left in the tank. Anderson, meanwhile, snapped a two-fight knockout loss streak with a decision win over Patrick Cummins. With the UFC needing fresh contenders at 205, Anderson could really jump up the ranks with an impressive victory over the former title challenger. 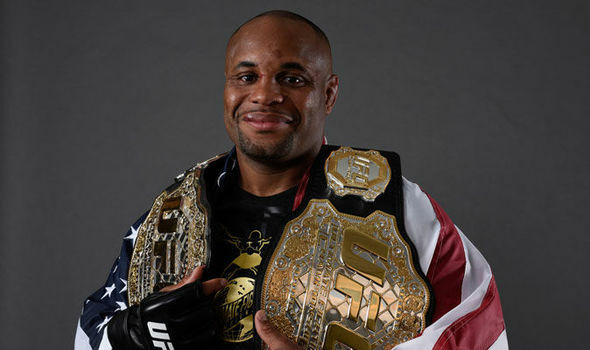 If Cormier plans on defending his light heavyweight belt, then he should keep it, but if he has no plans on returning to 205 lbs, he should give up the title and let the other guys fight for it. (At the very least, they should be fighting for an interim title -- if not for situations like these, what are interim belts for?) And though it's certainly true that the division isn't as interesting without Jones or Cormier involved, there are big light heavyweight fights coming up that could be made more interesting with title implications. 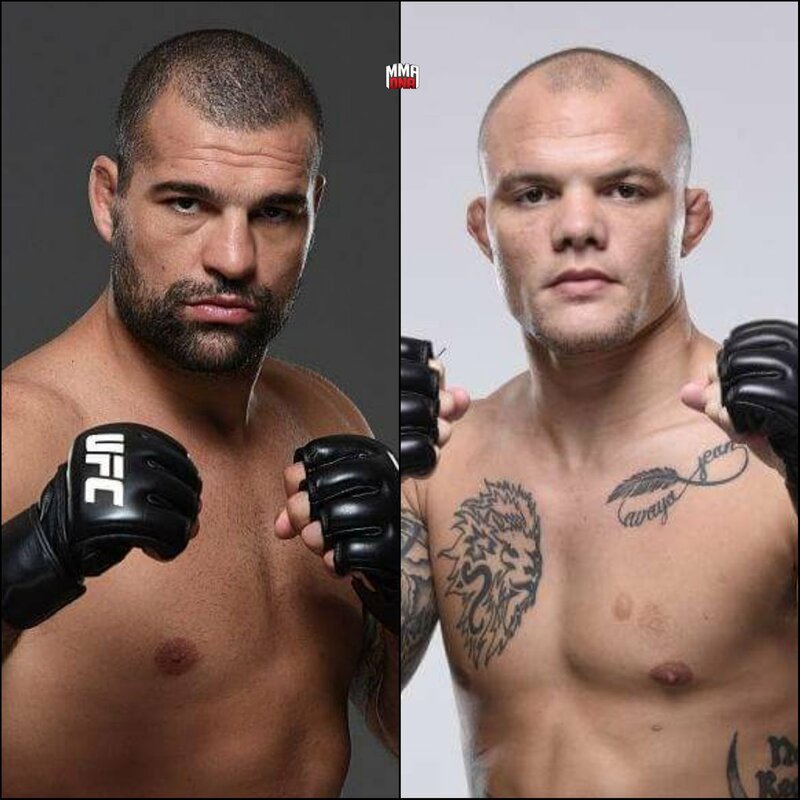 Two of them take place at UFC Hamburg, and when the smoke is cleared after the event, we should have a much better feeling of what the light heavyweight title picture looks like. My guess is the division looks a lot different a month from now than it does today.